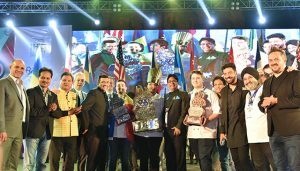 Bangalore : Six days, four cities and three thrilling rounds later, on the evening of 2nd February, 2019, France was the crowned winner of the IIHM International Young Chef Olympiad 2019. The winners were announced at the end of a colourful and grand closing ceremony befitting the standard of the Young Chef Olympiad was held at Nicco Park in Kolkata. Cyrene Randrianasolo, a student of Albert de Mun Hotel and Catering School, beat 49 other nations and was declared the winner of the fifth edition of the world’s biggest culinary extravaganza. 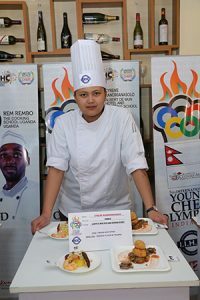 She was also the lucky first to wear the Golden Chef Cap given for the first time this year to the winner of YCO 2019. The silver trophy went to Romania’s Bogdan-Petru-Alin Vandici of ICEP Hotel School and the bronze went to England’s Luke Hayward from the University College of Birmingham. Along with the trophy, Cyrene also bagged a gold medal and was handed over a cheque for $10,000.